How many lions in Africa? These are the numbers proposed by IFAW, IUCN and Duke University in 2015. But realistically, we have to accept a very sad fact. For one of the most iconic species on this planet, we actually have no idea of how many lions continue to exist in Africa. That is because nobody has funded scientifically valid lion counts. But let’s have a look at the map above and the numbers quoted. See all those brown areas where lions are supposed to occur? Let’s just look at some of them. 1. It would appear that Angola is stuffed with lions. At least ¾ of that country is coloured in brown. How many lions occur in Angola? Nobody knows, and nobody has counted even one in the last ten years. It is likely that there are hardly any. 2. Mozambique similarly seems to be stuffed with lions. Look at all that brown colour on the map of Mozambique! The graphic says that Mozambique has 678 lions. That number is likely to be inflated according to recent information. And guess what? Most of those brown areas have not one lion. 3. Moving up the map, lions are still supposed to exist in vast areas of southern Somalia. Forget it. That is a war zone. 4. And then there is a huge brown area suggesting that lions occur across considerable areas in South Sudan, northern Democratic Republic of Congo, Chad, and the Central African Republic. No chance. So now let’s move on to the numbers of lions suggested by this “infographic” in various other areas. 1. Zambia is supposed to have 2,349 lions. Wow! Where did that number come from? Actually, based on more recent numbers published by researchers and safari operators, it could be estimated that Zambia has perhaps 400 – 500 lions. Most of those occur in the large nationally protected areas like Kafue and the Luangwas. The misinformation about the numbers of lions remaining in Zambia has led the Minister of Tourism and Arts to announce a reversal of a ban on trophy hunting announced in 2013. Now lions can be hunted again… without any independently verifiable count of lion numbers in that country. 2. Zimbabwe is supposed to have 1,362 lions. Wow! Where did that number come from? A recent survey of the huge Gonorezhou park in the south indicated that only 33 lions remain. No dedicated and scientific counts have been undertaken in Hwange, but these days estimates from old numbers range between 83-400 resident lions. The Mid-Zambezi area is supposed to contain large numbers of lions but has never been scientifically surveyed. The Bubye fenced lion trophy hunting area is supposed to contain 200 lions. We have no idea of how many lions remain in that country. 3. Kenya is shown to contain 2,515 lions. Based on what information? Despite probably more lion researchers per square kilometre in Kenya than in any other African country, we still have no verifiable information about Kenya’s lion population. In 2012 the Kenya Wildlife Service said therev were 1,700 lions in Kenya. Based on no real surveys. So where does the 2,515 number come from? 4. Botswana is supposed to contain 3,063 lions? Based on what information? The last scientific lion surveys in the north of Botswana were conducted in 2001. I should know, as I participated. Botswana does contain a very large number of lions, but 3,063 of them is a nonsense. 5. 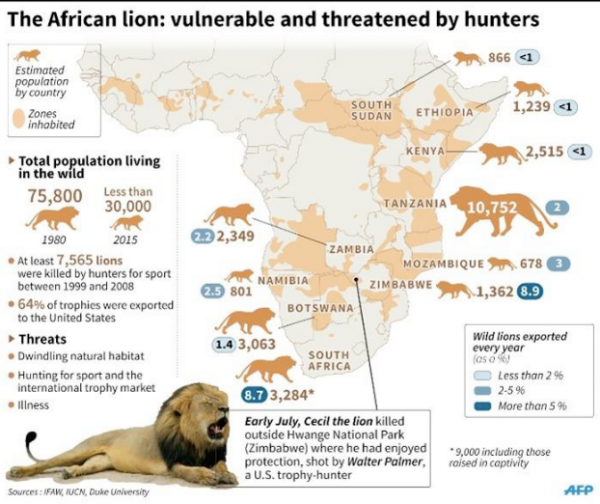 South Africa is supposed to contain 3,284 wild lions? Now where would all those be? Kruger might contain about 1,200 lions and then we start to struggle to find more. Yes, there are many fenced reserves that contain introduced lions, and there are many private reserves that contain lions, but all of those are heavily managed and placed there to attract tourists. The entire concept of a truly wild lion escapes definition in South Africa. 6. Ethiopia is supposed to contain 1,239 lions? And where does that number come from? I know of no verifiable lion population count EVER undertaken across Ethiopia. The Ethiopian wildlife authorities are very concerned about their lion population numbers. Perhaps a more realistic number of lions could be arrived at by at the very least halving that number? In conclusion, these sorts of maps and numbers do lions no service. What we need is no further extrapolations but a much more realistic number. And that will need some actual counts. Those will be expensive and time intensive, but there is no other option if intelligent ways forward are to be truly engaged to conserve this iconic species. We have lost our respect for lions and the animal kingdom! If we don't come together now it will be too late like for so many other animals who have gone extinct at the hands of man. Take a moment to be proud of nature! Belo.